We apologize for the inconvenience, but London Gallery in Shirokane will be closed on Wednesday, October 31st. Our location in Roppongi, however, will remain open according to its regular schedule. This time, I would like to introduce to you a sculpture of a female deity with an interesting hair piece. Sculptures of Shinto deities such as this first appeared in Japan in the early Heian period. Originally, Shinto gods were not represented and enshrined in physical forms such as this, but were rather thought of as spirit-like entities that resided in places such as mountains and waterfalls. 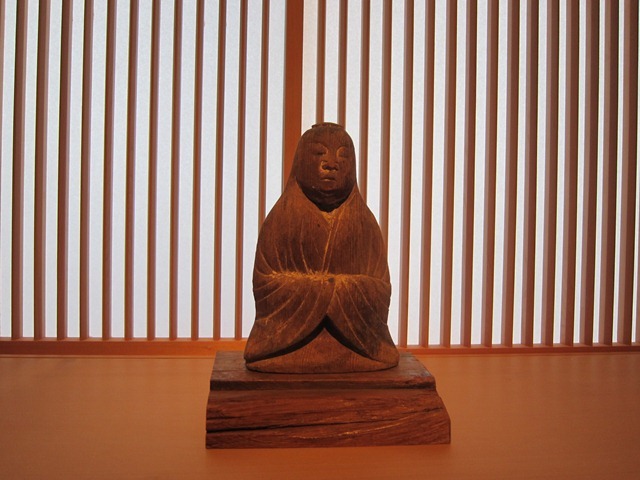 The honji suijaku concept of Shinto-Buddhist syncretism that developed in the Heian period holds that Shinto deities are in fact Japanese manifestations of various buddhas and bodhisattvas, and as such, they soon too came to be physically represented and placed in shrines as objects of worship. 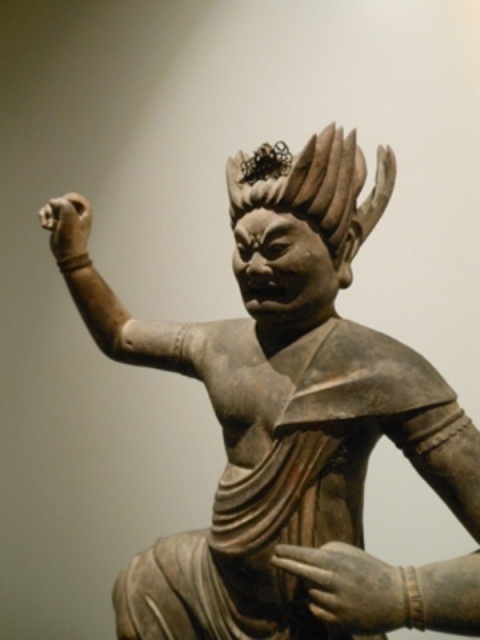 These sculptures took a number of forms, from monks, aristocratic figures, or even those close to Buddhist deva kings. On top is a unique feature not seen on other sculptures of this type, which is a hair piece in the shape of a flower. 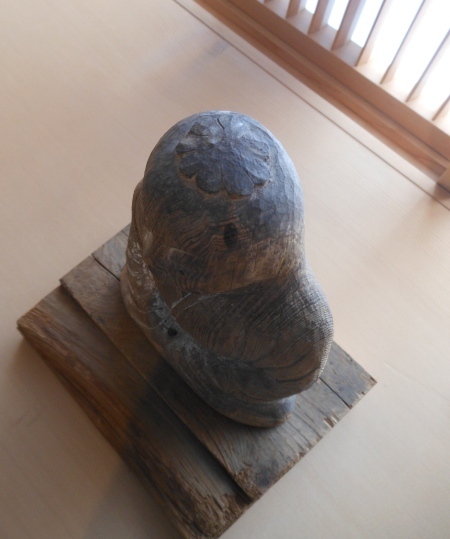 Looking straight down upon it, it almost appears as the top of the head of the mythical Japanese Kappa. Our current exhibition goes until Friday, November 2nd, and we hope that you will come by and see the show before then. We apologize for the inconvenience, but London Gallery's Shirokane location will be closed for two days, Thursday October 18th, and Friday the 19th. The gallery in Roppongi, however, will be open according to its regular schedule. Thank you for understanding. We would like to announce the latest exhibition rotation at the Shirokane gallery. 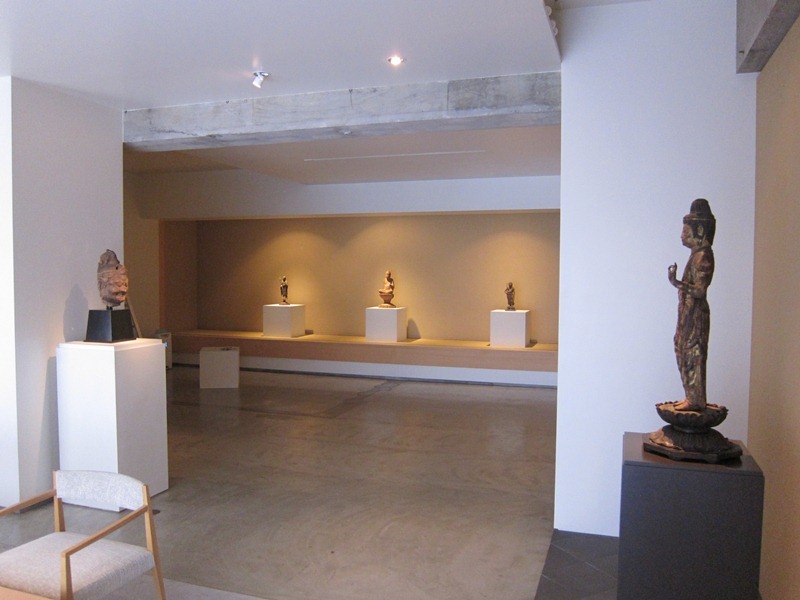 We have changed the previous exhibition of stone sculpture to a new show exclusively featuring wooden sculpture. Welcoming visitors to the show is this large sculpture of Zaō Gongen from the Heian period (794 - 1185). The exhibition includes works from the Nara, Heian, and Kamakura periods. Techniques and styles vary greatly from one period to the next, and comparing different works with this in mind is a fascinating exercise. By all means, please do come by the gallery for a firsthand look. ※Please note that certain objects will rotate during this period.